It's good to se a good project published here. Please continue to build! We need more of that. solars wrote: A ship, for the river that flows through Karsthafen-Königsdorf. Tar and gzip may not be necessary there, that's right. To my knowledge, .mts already does compression for each 16x16x16 mapblock. There may still something to be gained from doing compression on the whole construct. Only the node mapping is uncompressed in .mts files. I have replaced the .tar.gz-File with a uncompressed .mts file now. This should be unproblematic with all systems and if the data is compressed in the .mts file, a second compression is irrelevant at it is. Some time ago on VanessaE's almost vanilla server I built a little wooden hut on the beach of a scenic lake. To gather resources I had a little mine near spawn. People kept digging through the roof of the mine so I started building a structure of glass and diagonal braces of red stone above it. Eventually it got quite high but SpawnCity developed and my little tower was soon dwarfed by much higher buildings. Never the less I experimented with local copies of the mine and thought it might be usefull for others or interesting to play with the concept of a mine as schematic file. This is what the building should look like once it is put in place as intended. To achieve this unzip the schematic file towermine2.we into a schems folder of your world. Once you have the WE priviliges go to the southwest corner of your construction site, stand on the level intended for the entrance and type //pos1 into the chat console. You might want to fly about 200m up and 100m down now (type h to use noclip for flying down) to make Minetest load the chunks the building will be generated in. Now type //load towermine2 into the chat console. The building will be generated to the north and east of pos1 and as for now all above ground. Next go to the diagonal opposite corner of the building and place your avatar on exactly the opposite corner of the stone structure. Now fly exactly upwards only. Once you are higher than the glass spire tip, type //pos2 into the console. Now comes the tricky parts. To force the open spaces to not be filled with underground nodes we will replace them. Type for example //replace air papyrus to fill all air in the selected area with papyrus. You should have a pretty green building now. To move the building underground now type //move y -100 into the chat console and after the building has regenerated finish by typing //replace papyrus air into the chat console. Now you can wander down the stairs and start mining the exposed walls. If you place the structure through some lava lakes these will now spill into the building, so have some glass handy for spectacular windows. It might be advisable to try placing the building on an extra map first to get an idea of how WE works. There is no easy way back and you may destroy a map if it does not work as you planned. Floating in the sky you can see the dimensions of the whole structure. In the front you can see what happens if the mapgenerator wants to join the fun and adds some caves and dirt to the building. Preloading the chunks including the air of the area you will work in may help to stop this happen. The tower and the mine are still very much as build on the server so expect some design changes as in the top two levels of the tower and expect ores all over the place as most of the underground was dugout and not built. I have changed the entrance level a little as on the server it is underground and one side is unfinished as it is protected area of someone else. No extra mods should be needed for this building. Last edited by twoelk on Sun Mar 22, 2015 02:38, edited 1 time in total. A somewhat crowded Visitor's Center, the first building built in Glasstown on my singleplayer server. The Hotel "Blaue Augen" (in english: Blue Eyes) is a big luxurious hotel, that I have build for Karsthafen-Königsdorf. You can find 240 rooms, a big swimming bath, a fitness studio, a conference centrum and much more in this building. For this WorldEdit file, no other addons are needed. The Building stand at a riverbank at the map. So the groundlevel on the front and the back are different. The download is deleted, since it shows, that the license ist not realy accepted in this sub-forum. Last edited by solars on Sun Jul 08, 2018 19:27, edited 1 time in total. Suggestion : rename the file 'hotel_blaue_augen' to something more simple (eg. 'hotel_ba'). We're not all familiar with the german typo and quicker to enter in command. 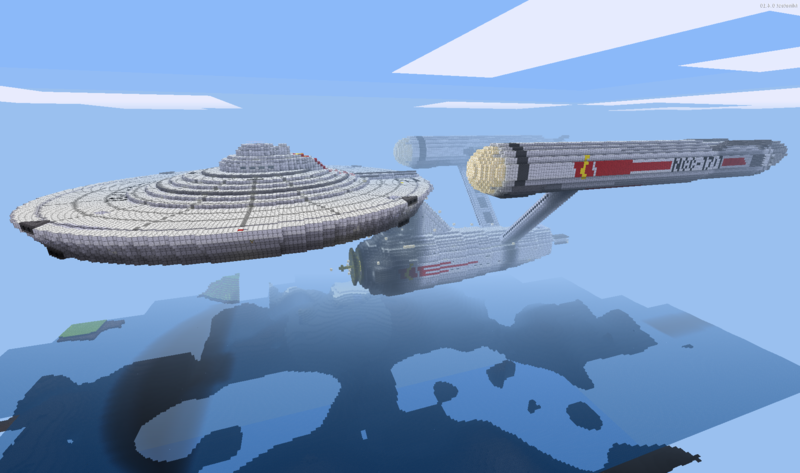 USS Enterprise. NCC-1701. No bloody A, B, C, or D.
The ship is 1:1 scale on the outside. On the inside I made the decks 4 meters between floors so there would be room to move around which means there aren't as many decks as the "Real" Enterprise should have. I originally built this in that other voxel game so there are some rough edges where something didn't quite translate. You might find a few missing nodes here and there. None of the redstone circuitry translated properly into Mesecons so the doors don't open (where there are doors) and the blinky lights don't blink. Probably depends on the Nether mod since it has a lot of glowstone throughout. I didn't do much to finish the inside. There's a bridge, and I did some basic finishing work in the engineering section. I had to export this three times before I finally got one that didn't catch on fire as soon as it was imported. There used to be lava flowing through the engine pylons for effect. Had to remove it. One odd thing, the schematic imports inverted, so the lettering on the saucer and the nacelles is reversed. Not sure how to fix that. Just a thought, there are hundreds of minecraft structures available on the loads of sites without owning minecraft. http://www.minecraft-schematics.net/minecraft-schematics/schematics-list.html - but the website has hundreds of popup ads (the download page hides the links with ads!!). Unfortunately you don't seem to be able to import the schematics directly with worldedit. You don't need minecraft, but it can be a bit of a pain to convert them. Steps seem to be. and as you may have missed previous discussions concerning importing Minecraft based maps or schemastics for the Pripjat and the New York servers, at some place you run into filesize limits. Either your local system or Lua seem to have a limit how large a single import can be. The maps for both servers had content imported in slices that had to be stitched together in Minetest. @twoelk: I was aware of the size limit (one of the reasons I suggested we work on a raw python import script - the code already exists to extract from minecraft 1.x to blender, so shouldn't be too difficult to modify and tack on an import to sqlite https://forum.minetest.net/viewtopic.php?f=12&t=6007&p=169192#p169192. In any case, yesterday I was attempting to import a relatively small minecraft .schematic which failed. However admittedly I tried with the new .11 version which (for me) seems to have lots of problems with mods failing, so could have been this. I did do a large edit on worldedit some time ago (which unfortunately got completely ignored by the mod developers) which seemed to allow import of much large mods, but I have no idea why. My recode allowed the user to mark and align/rotate the import to particular locations before an actual load after I got irritated with the completely random positioning the current worldedit considers is reasonable. However I didn't try any memory optomisation, and although it did get rid of some of the (essentially) duplicated code it didn't particularly change the number of function calls in a typical worldedit load. Possibly though the reconfiguration of nested functions contributed, as with the old/current version, the entire import was passed to various functions, which if it was being duplicated in memory may have contributed to overflow. Sorry, sl off topic. essentially though I think worldedit under lua is incapable of the size and speed of imports we should be fairly easily able to acheive with a raw python script. can someone put up a death note map like they have for minecraft. i would love to have a death note world but i can't find one and building it takes too long. ryanheidecke wrote: can someone put up a death note map like they have for minecraft. i would love to have a death note world but i can't find one and building it takes too long. If you install mcimport you'll be able to import yourself, admittedly its not perfect yet, but its pretty good. The house was built close to spawn and got griefed. Getting the protectors to work properly in that situation was very difficult, and the house was maybe too big and complex for that protection mod anyway. After the griefing occoured and rollback was not available, we mutually agreeed to have the house beeing teared down. The way lighting works adds a nice color pattern to the baked clay floor, wall and ceiling of each room. Really nice of you to share :) It's amazing someone would mess it up. Jerks. That is one amazing build Sokomine. Thanks! Hope the house will load. Don't forget to explore it on the inside! It ist completely furnished. Each hotel room has its own bathroom, and there's a lot to see in general which does not show up on the screenshots. That's a really nice and cheerfull house Sokomine. That unknown nodes are the Xanadu only version of backed-clay I presume. I am slowly forgeting all the places I built on the different servers. I hope you have all youre buildings collected somewhere. That would surely make a quite impressive Sokomineville by now. BTW on the griefing front, I've discovered that it's very difficult to control the android minetest version, and as a result extremely easy for some inadvertent griefing. My daughter must have been in the running for saint-hood after she went round patching up numerous holes I made in her house. It's even worse with a slow network, you often don't even know you've done it.